What is consciousness? And why does it matter? The two of us have come to appreciate that personal growth and fulfillment arise when we raise our consciousness. So what exactly is consciousness? In an attempt to answer this, we have scoured the Internet. We've read lots of books and attended courses. We've found that the word 'consciousness' is used in many different ways. It's not easy to grasp definitions by scientists, academics and philosophers that embrace the infinite, the cosmos, spirit, soul, mind, micro-cosmos and quantum physics. It seems many perceive consciousness to be an infinite field of energy that includes all forms and the history and potential of all existence. As individuals, we have a present level of consciousness, can raise our consciousness and are an integral part of infinite consciousness. How we identify with ourselves and life depends on our own consciousness level. The two of us have personally experienced shifts in consciousness and we know directly its power to create miracles and transform our lives. As a result, we want to demystify consciousness so we can more easily grasp how to work with it to improve our quality of life. If we want a happier, healthier, more meaningful life, then we need to live more and more consciously in each moment. We can raise consciousness when we expand our understanding of and alignment with our innate nature. And as we raise our own consciousness by setting clear intentions, we support increasing consciousness on the planet. As we participate in higher consciousness, we begin to grasp just how much we create our own reality. These insights enable us to put ourselves more firmly in the driver's seat. We begin to release old patterns and live with greater ease, contentment and freedom. The higher our consciousness, the more we appreciate and enjoy ourselves and the world around us. Jeddah Mali describes consciousness as a tool to examine experience. She likens it to a flashlight that allows us to shine light on our experience in each moment so we can see it clearly. We find this metaphor to be particularly helpful. With a flashlight, we can explore everything in life. The quality of our view depends on whether the flashlight beam is focused or scattered and whether it is strong like a flood light or weak from low batteries. Our view with our flashlight can be as powerful as sunlight or dark because it is turned off. The condition of our flashlight and our skill in handling it create our unique view and experience of the world. Unlike plants and animals, we humans have the ability to be self-aware. We possess both the mental capacity and the will to pay attention to our experiences and choose a higher state. We can proactively raise our perspective, motivation, intentions, focus - our level of consciousness. And perhaps that is our main purpose in life – to shift our ability to perceive life and who we are to a higher level. To raise our consciousness, we must expand our sense of ourselves and what's possible for us. Imagine you are in a glass elevator. As the elevator rises, you see an increasingly larger view of what's around you. You get a bigger and bigger picture of life. As our vision expands, we experience more interconnections, finer distinctions and more meaning and purpose. All the puzzle pieces fall into place in a larger, connected pattern. From a higher perspective the parts make more sense. If we want to raise the consciousness of a situation, we need to expand the possibilities for that situation. To do this, we can make our response and/or intention more qualitative, loving, beautiful, natural, altruistic, spiritual, inclusive, impersonal and universal. As we have explored our own consciousness, we have discovered that there are signposts or markers that reflect our level of consciousness back to us. Others have described many levels of consciousness; however, we think the consciousness journey can be described more simply. We have defined in clear and easy terms, three levels of consciousness and the experiences that accompany them. These levels serve as gentle guides for where we are on our journey through life. to surrendering to our higher guidance. At Higher Awareness, we are actively exploring life through these three levels. We invite you to join us, to experiment with these perspectives so you can experience for yourself how knowing the bigger picture can significantly alter your quality of life. The magic of shifting consciousness is that it changes the very fabric of who we are and it affects us in many more ways than we expect. Any time we develop clarity or integrity or create confidence in one aspect of our being, it affects our whole character and therefore all areas of our life. Whether we're happy or sad, fearful or loving, healthy or ill, our experience is rooted in our level of consciousness. It's only when we change our consciousness that anything changes in our experience. Please join us in stretching our frontiers of understanding and experience. 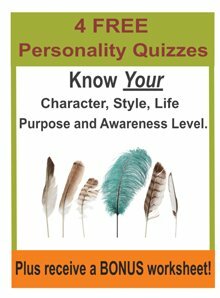 Check out our other Inspirational Articles on other personal growth topics.